Niagara Peninsula Aboriginal Area Management Board (NPAAMB) announced the launch of two new programs and nearly $9 million in federal funding, Wednesday, designed to provide urban Indigenous youths aged 18 to 30 years old with skills they will need to help them on their way to successful careers in construction, tourism and health care. NPAAMB executive director Shari St. Peter said the first of those programs, Building Futures, starts April 16, providing construction trades training for 180 participants during the four years it is being offered. It is being run in conjunction with Habitat for Humanity Niagara, Mohawk College and the YMCA, offering on-the-job training to students who will pitch in on the construction of 15 Habitat homes —including four homes the organization is planning to build in Welland this year. Habitat chief executive officer Alastair Davis said the program "will empower you to manage and pursue new employment opportunities while helping to transform skilled trades student training right here in Niagara, and beyond, and at the same time building 15 homes to help 15 local families. That program will receive $5.7 million in federal funding, as well as in-kind contributions from partner agencies for a total cost of about $8.2 million. St. Peter said the Journey to Success program, starting May 7, will provide 112 students over four years with training in hospitality, tourism and health care. Graduates will also receive certificates from Niagara College, "which is going to help increase the employability of our youth," he said. College president Dan Patterson said the program is designed to "open up new doors for Indigenous young people and to explore further training and apprenticeships, job opportunities and post-secondary education." "We are pleased to be working in the two areas that are centres of educational excellence for Niagara College: health care and the hospitality and tourism sector," he said. The federal government is providing just under $3 million in funding for the program, while the organization's partners are pitching in about $800,000. NPAAMB president Marie Jones attributed the launch of the programs to the organization's executive director, St. Peter, "whose magnificent brain has made so many wonderful things happen." "There was strategic partnering going on to make this happen, for the numbers that we're hearing today," Jones said. "It is, in my opinion, the true spirit of truth and reconciliation." Niagara Centre MP Vance Badawey said the funding was provided partly through the federal government's skills and partnership fund, with the objective of enabling "Indigenous organizations to experiment, to train, to be innovative, by using partnerships, by working together with credible hardworking organizations as well as individuals." Badawey said the funding is also consistent with the federal government's focus on creating an inclusive country. "Our government has often said there's no relationship more important than the one we have with Indigenous peoples throughout Canada," he said. 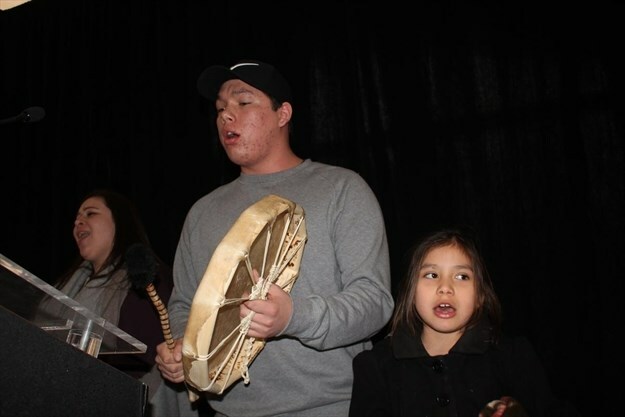 The announcement came at the conclusion of a three-day NPAAMB youth conference called Building Leaders of Tomorrow, at White Oaks Resort and Spa, an event that brought together hundreds of Indigenous youths from the communities within the organization's jurisdiction, including Fort Erie, St. Catharines, Hamilton, Brantford and Kitchener-Waterloo. Elder Janice Longboat was at the event throughout the conference, spending time with youths who attended. "When we look at culture, the foundation of who we are as Indigenous people, the old people used to say it's easy to understand culture," she said. "It's a bundle of knowledge and wisdom and action that we put together for our young people so that they can carry on to the next generation."